I am back with another curly hair product review! 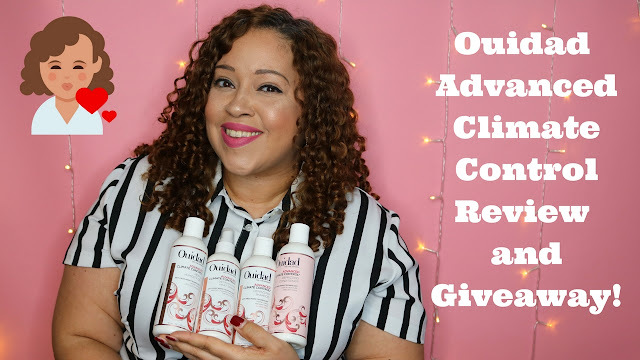 Ouidad recently came out with their new Advanced Climate Control Line which consist of a Defrizzing Shampoo, Conditioner, Detangling Heat Spray and Heat & Humidity Gel. I can't say enough good things about these products. To hear my thought and full details on the product, make sure to check out my YouTube video. Also scroll down to find out how to enter win a giveaway of the whole collection! To win make sure to enter below! US residents only. Contest ends 4/29 and winner will be picked on 4/30. Don’t forget to like, comment and subscribe! Ouidad Advanced Climate Control Collection Giveaway!